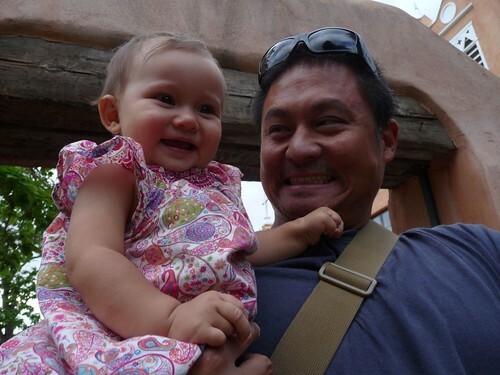 Mali Mish – Day 108: Old Town Albuquerque. 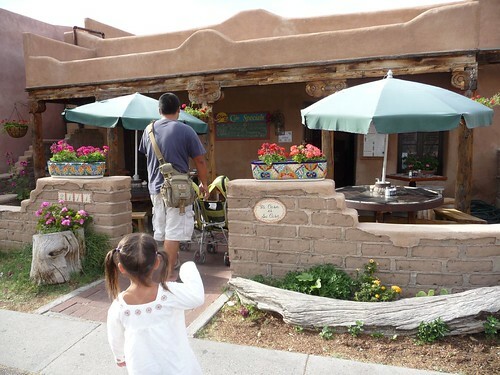 Day 108: Old Town Albuquerque. 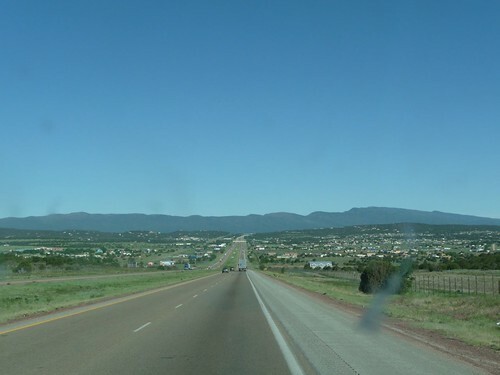 After a nice night at the Walmart parking lot of Edgewood, New Mexico, we descended down into Albuquerque and began looking for a place to stay for a couple nights. We did our usual search online and found that there was a KOA right off of the freeway. Being that it is a Tuesday, we didn’t think we would have any problems getting a space there but we called them anyways. On the phone, the person told us that they were filling up fast and that if we wanted to secure a spot, we might want to reserve it with a credit card. Since we were only a few minutes out, I told Marlene to hold off so we can at least see it before making a decision. Well, I don’t know what the person on the phone was talking about. There is NO ONE here. I mean the occupancy rate was probably 10% at best. It is a little annoying to have people lie to you on the phone just so they can make a buck. 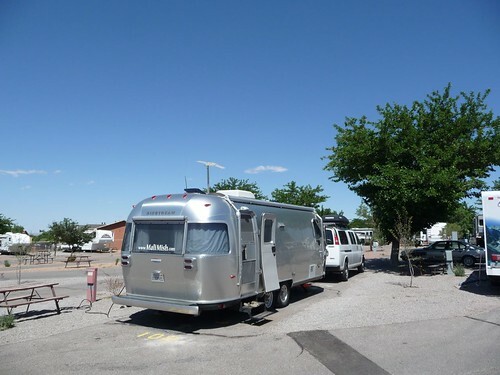 The KOA in Albuquerque is not really in the best part of town and literally right over a concrete wall from the freeway. We weren’t going to stay here very long and being as hot as it was, we decided to just pony up the cash and get a patch of concrete in their parking lot with hookups. 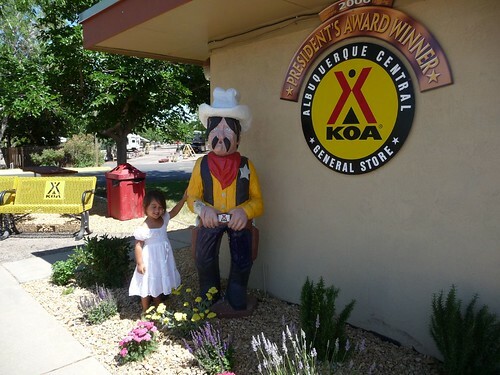 We are certainly in the west now as you can see with the cowboy statue right outside the KOA office. I don’t know what the President’s Award is about but I doubt it has anything to do with being honest about your vacancy rate. 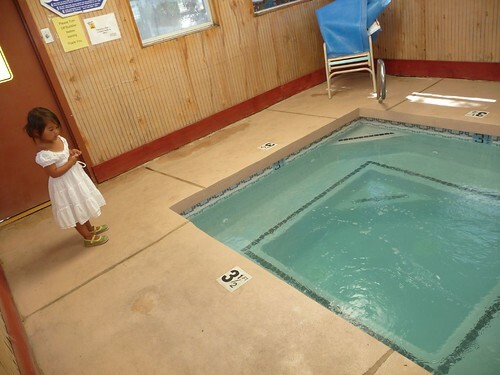 It was well into the 90s outside and the last thing you would want to do is to jump into a hot tub. They actually have an indoor one which Ava has not seen before. I guess it snows here in the winter time and hot tubbing with a glass of wine is probably a real popular “Après-ski” activity. At Walmart, we picked up a kite for Ava. 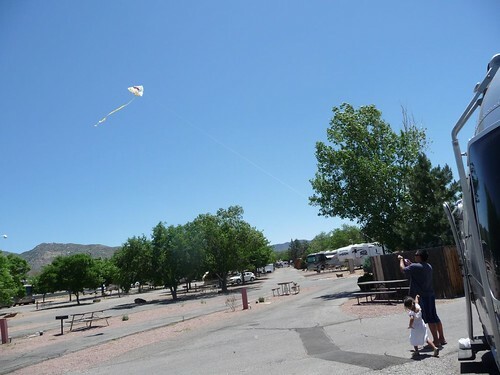 She has never flown one before so I decided to pull it out right at the empty RV park and give it a worl. It flew like a champ. In fact, it flew so well, after a few minutes of reeling out the line, I managed to lose my handle on it. You would think that it would probably dive bomb right back down to earth without a handler but I couldn’t believe it when it just kept flying over the wall and on over the freeway. Oops, sorry Ava. Hopefully it didn’t land on anyone’s car as they were driving. 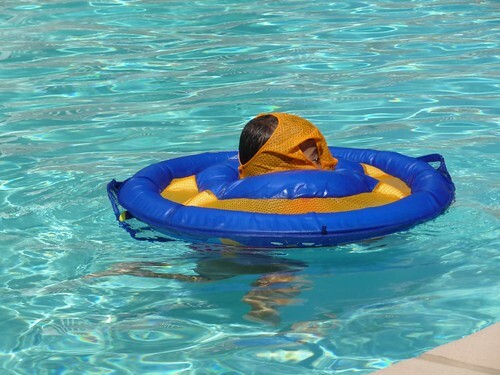 The heat made taking a dip in the pool the perfect thing to do here in Albuquerque. Staying at a KOA for us is splurging as it tends to cost more than a State Park, so we like to take advantage of the amenities. 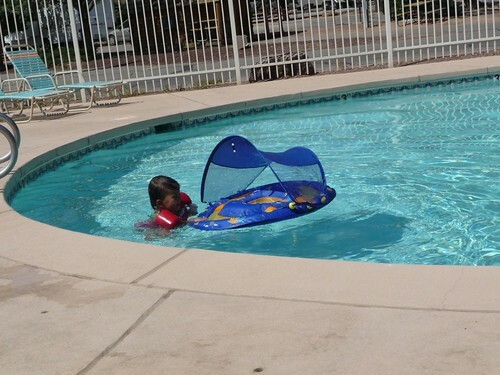 Ava brought in the little shaded float tube she used to sit in as a baby and wanted to give it another try. I don’t think she remembers quite how it is suppose to work. One thing Ava is starting to do now in the pool is being able to hold her breath and close her eyes when she dunks her head under water. We even got her to use her Ariel swimming goggles so she can try to open her eyes as she swims under. The only problem is those goggles don’t keep out the water all that well so she ends up having to re-fit them every few minutes. Last time we came through New Mexico, it was in February and we drove through Las Cruces along the I-10. 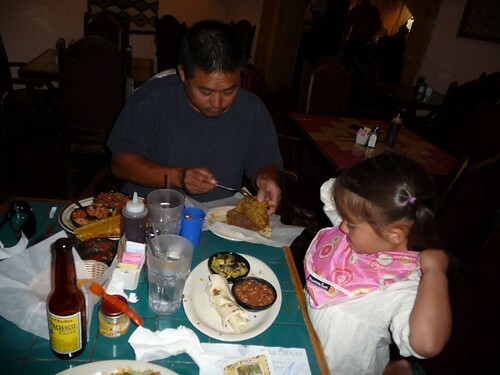 Las Cruces is a smaller town but it has much of the same characteristics of Albuquerque. 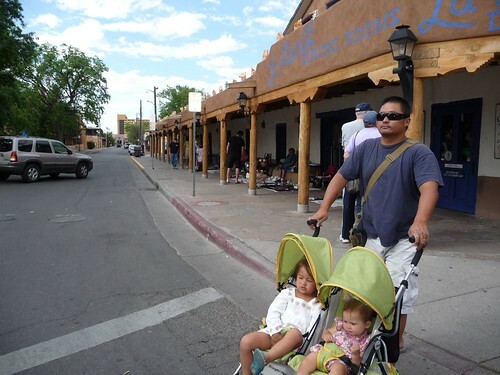 The southwest architecture, the native American and Spanish influence in culture, cuisine and lifestyle are very much the same. 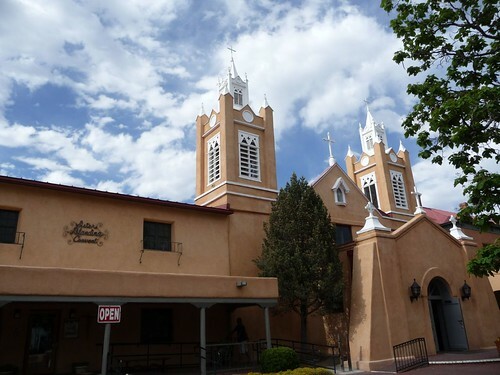 In old town Albuquerque, one of the main landmarks next to the town square is the San Felipe de Neri Church that has been here for over 200 years. 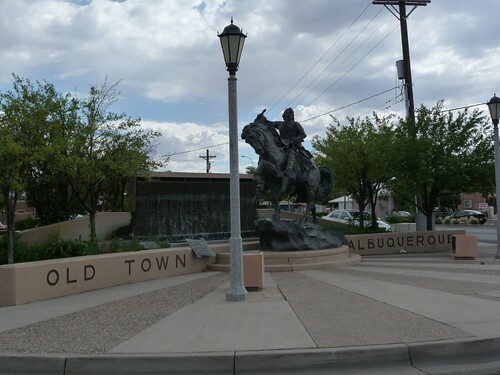 It is named after King Philip of Spain and is the oldest surviving building in all of Albuquerque. It is still a full operational Catholic church and holds mass every Sunday. We walked around the square at the shops to check out some southwest merchandise with the girls in their double strollers. 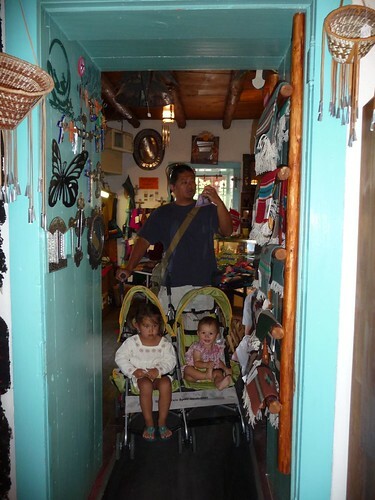 Apparently these shop doors weren’t really made for these side-by-side double strollers. How do I get out of here now? Wait a minute, how did I get in? From one of our trusty guide books, we were referred to the little restaurant just behind the church on Church Street aptly named Church Street Cafe. Church Street Cafe is housed inside a historical building named Casa de Ruiz. This building has been around almost as long as the church shortly after the founding of Albuquerque in 1706. It had been a residence to the Ruiz family all the way up to 1991 when the last surviving family member, Rufina Ruiz, passed at the age of 91. Since then it has been converted to a restaurant and the inside no longer looks like an old 18th century residence. The food here was outstanding. I think it’s pretty hard to screw up Mexican food but on the other side of the token, it is also not that easy to stand out above the crowd. 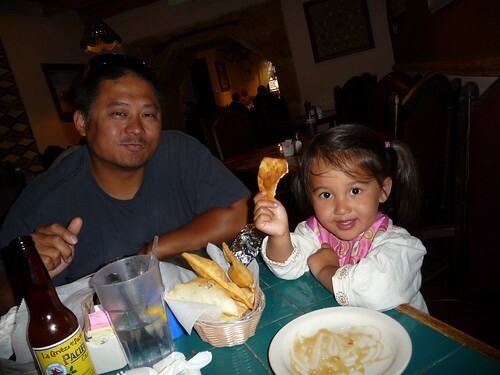 And just as we did last time in New Mexico with our friends Claire, Daniel and their girls, we had to get in on the Sopapilla action for a little dessert. I don’t know why Mila is so happy. She is too little to eat Sopapillas yet. Maybe next time. 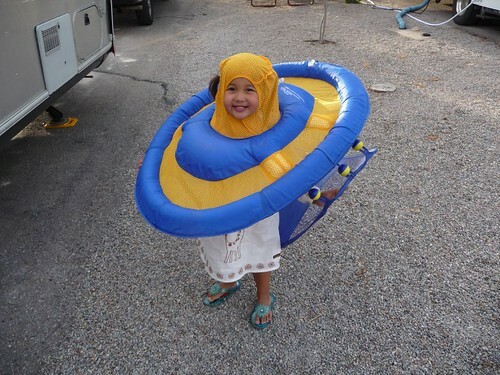 Well, if Ava insists on wearing the floaty this way, who am I to be a party pooper? Go on with your bad self Ava! With full bellies and 2 fingers in the mouth, Mila is ready for night-night. We are soon to follow. One Response to Day 108: Old Town Albuquerque. Seeing your photos makes me long for our trip. It seems like SO LONG ago.